Following the explosive events of Star Trek: Nemesis, the Romulan Star Empire is in disarray, and Ambassador Spock attempts to render aid by launching a last-ditch effort to reunify the Romulans with their distant forebearers, the Vulcans. But when Spock is publicly assassinated at a Romulan peace rally, Starfleet and the Federation are unable to search for the criminals responsible without triggering an intergalactic war. From the nightmarish landscape of the Mirror Universe Earth to the joys of impending parenthood and marriage to the woman he loves, James T. Kirk is propelled into his most personal and dangerous mission yet, as he fights to uncover the secret of Emperor Tiberius' return, and learn the terrible truth behind the madman's real plans for the Federation. 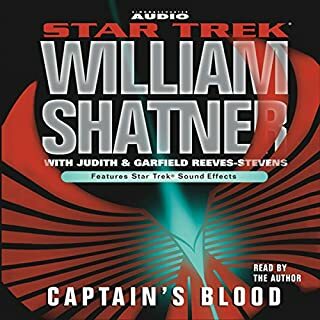 Written and read by William Shatner! Two men and two universes collide, as the honorable, idealistic Starfleet Captain James T. Kirk is forced to compromise his ideals to save his wife. Kirk agrees to help the tyrannical Emperor Tiberius destroy Captain Jean-Luc Picard's U.S.S. Enterprise, and in the process receives a message from the Preservers - a technologically advanced civilization revealed to Kirk by mysterious aliens. 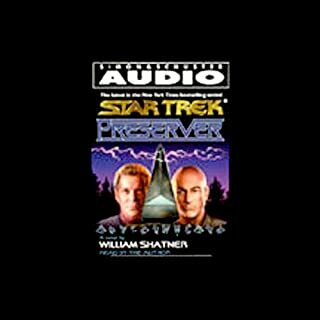 Written and read by William Shatner! But when James T. Kirk and Jean-Luc Picard arrive on Bajor to dive among the ruins of an ancient sunken city, conditions are far from what they had planned. The small group of scientists the captains have joined suddenly find their equipment sabotaged - isolating them from Deep Space Nine - and any hope of rescue - as one by one, a murderer stalks them. 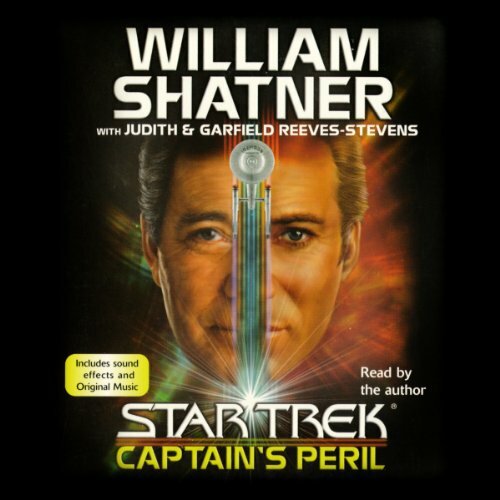 From the breathtaking shores of Bajor's Inland Sea to the welcoming arms of a seductive and deadly alien commander intent on making Kirk her own, Star Trek: Captain's Peril spans space and time to present Captain Kirk's most personal, and most extreme, adventure. (P)2002 Paramount Pictures. All Rights Reserved. AUDIOWOKRS is an imprint of Simon & Schuster Audio Division, Simon & Schuster Inc. The book was absolutely amazing. I Loved it . 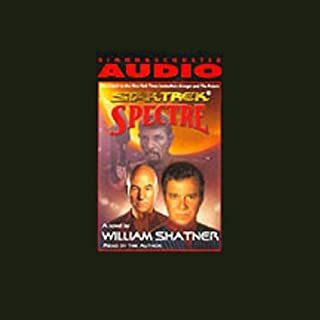 Even better , narrated by William Shatner himself . 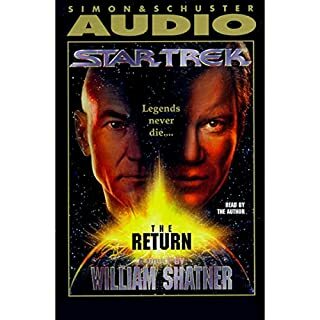 I've always enjoyed listening to the "Shatnerverse" series of novels. 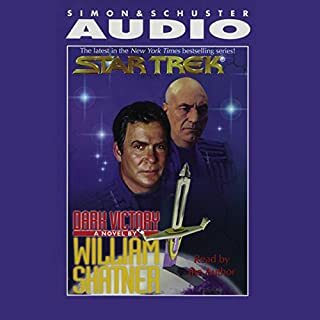 Shatner isn't the best writer, but he is an excellent narrator and the production values of the audiobooks are impeccable. Plus, Shatner writes Old Kirk like he's a superhuman genius (presumably with a lush and completely natural head of hair) who must explain everything to his new sidekick Picard, which probably isn't meant to be as funny as I always find it to be. So, what could possibly be next after Kirk has been resurrected by the Borg and taken a trip to the Mirror Universe? Well, how about... a lightweight Bajoran murder mystery and a flashback story with the old crew that would have been an okay-at-best episode of the original series. Now, don't get me wrong, neither of the plot-lines are bad, it's the first book in a trilogy where things are being set up, and it's still an enjoyable way to spend 3 hours. However, the two plot-lines are only very loosely connected to each other and, quite frankly, it wasn't clear to me why the flashback story kept coming up. It makes sense at the start because Kirk is telling the story to Picard, but then it keeps going long after Kirk has stopped talking to Picard about it. 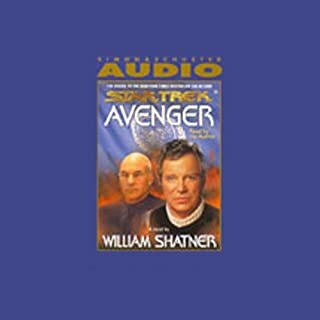 Maybe the novel is structured differently so that things flow better, but I just didn't think it worked well in the abridged audiobook. Anyway, if you like Star Trek and you like Shatner, then you should get this. It really is as simple as that. Just don't let this be your introduction to the "Shatnerverse", because The Return and Mirror Universe trilogies are much better. Oh, and one more thing. Shatner clearly has Picard say "sabotage" while Kirk says "sabataage". If you know why that's so funny, then you should be a big enough fan to already own all the audiobooks.